Fuji Five Lakes "Fujigoko" is the name of the area located at the northern base of Mount Fuji about 1000 meters above sea level. 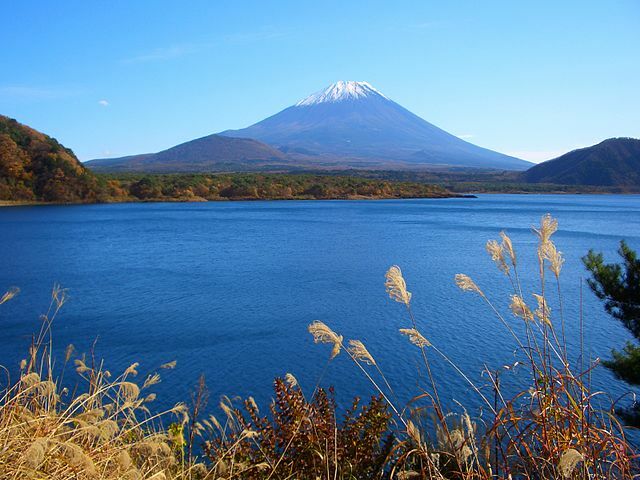 The name Fuji Five Lakes comes from the fact that there are five lakes formed by previous eruptions of Mount Fuji. From East to West, they are Lake Yamanaka, Lake Kawaguchi, Lake Sai, Lake Shoji and Lake Motosu. They are all considered excellent tourist attractions, where hiking, camping, fishing and snow sports are among the popular outdoor activities that can be enjoyed. 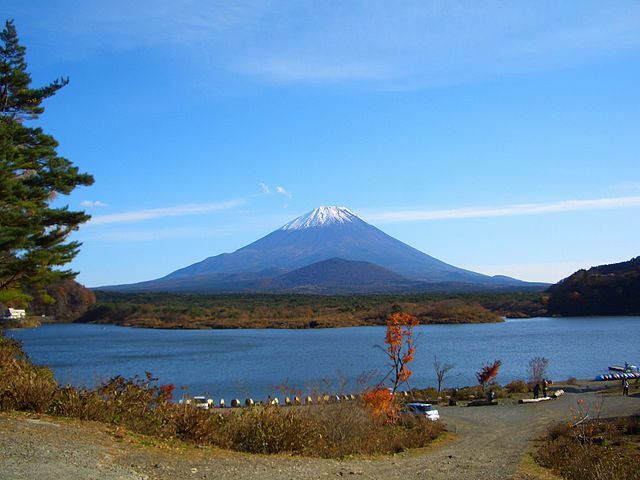 It is also one of the best places to view Mount Fuji from a close distance and a good base for climbing the mountain. ​Bus service is available from Kawaguchiko Station to Kawaguchi Fifth Station, the most popular place from which to start a climb of Mt. Fuji. Lake Kawaguchi "Kawaguchiko", is the easiest to reach and the most touristic of the five; it's also the only one to have an Island. There are several views on the Fujisan around the lake. You can see its reflections in the water from the north shores surrounded by cherry blossoms in spring or lavender field in summer. Extensive local bus service is available, particularly in and from Kawaguchiko Station, which is the most popular launching point for exploration of this region. The Kawaguchiko Retro Bus, serves the path around the lake, stopping at many of the local tourist attractions like the museums or parks. 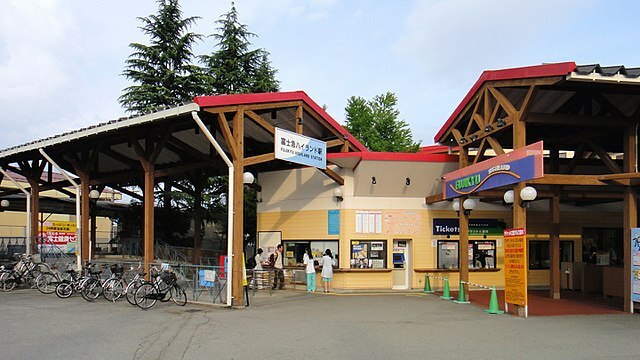 A two-day ticket costs 1,500 yen for adults, which you can buy from the bus ticket office inside Kawaguchiko Station. The Omni Bus Red Line connects Kawaguchiko Station with the Kachi Kachi Ropeway Station, stopping at Yuransen Ropeway Iriguchi Bus Stop "15 minutes". It is also possible to walk from Kawaguchiko Station to the ropeway station in about 20 minutes. 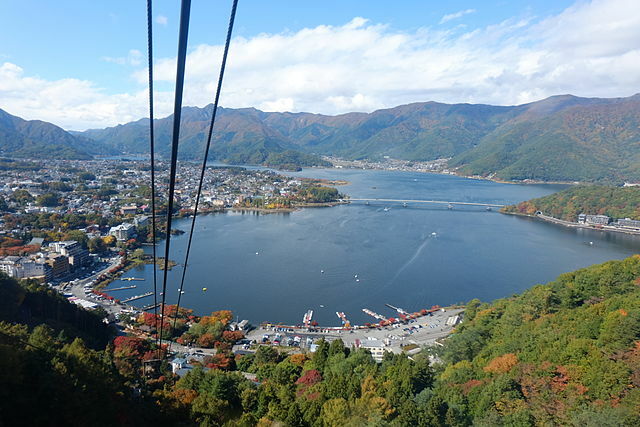 This short cable car climbs 400 meters to a viewing platform next to mount Tenjo. There you can enjoy nice panoramic views of the lake below and of Mount Fuji, and also have a tea and eat Dango "rice flour dumpling". There is also a hiking trail from the observation deck down the forested mountain slope which takes about 30 minutes to descend. A different trail leads from the observation point 300 meters uphill to a small shrine at the summit of Mount Tenjo. Itchiku Kubota Art Museum on the northeast shore of Lake Kawaguchi was designed by the artist himself. Kubota was Japan's premier modern kimono designer, and this museum houses his incredible series called "Symphony of Light. Momiji Corridor is on the north shore, a few minutes’ walk from the Kawaguchi Konohana Museum; another celebrated tree-viewing spot. 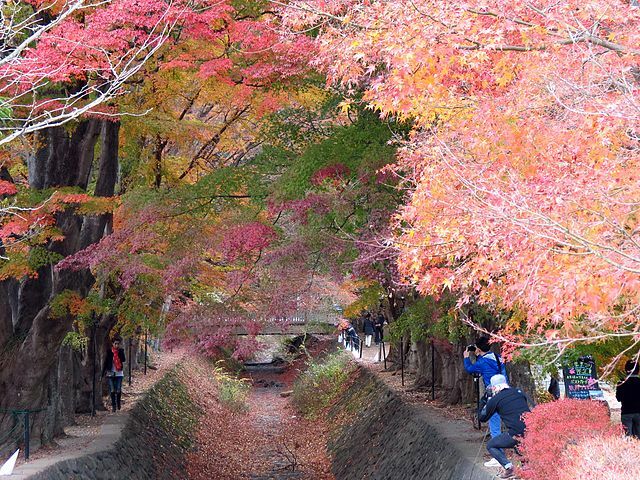 A variety of beautiful trees, including maples and ginkgos, line a small river on a gentle slope. The trees are lit up at night during the autumn tree viewing season. To see the Momiji Tunnel on the north shore; on foot, from the last stop of the Retro Bus, walk carefully to the west along the road "no side-walk". 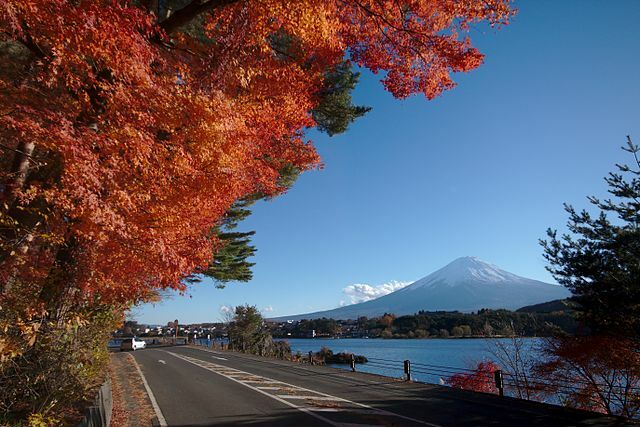 In autumn, the orange and yellow tones of changing leaves are beautiful, and there is also a nice view on the lake and the Mount Fuji. Lake Motosu is the furthest out, also the deepest and clearest lake. Rental paddle-boat and rowboat and also a sightseeing boat are available. 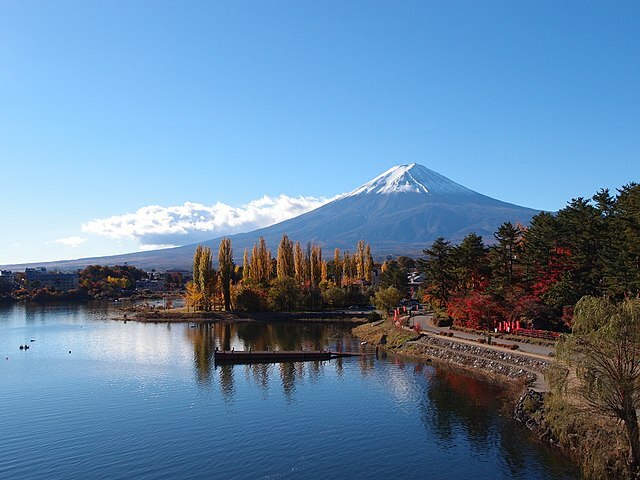 Lake Motosu is best known for its appearance on the reverse side of the 1000 yen bill. 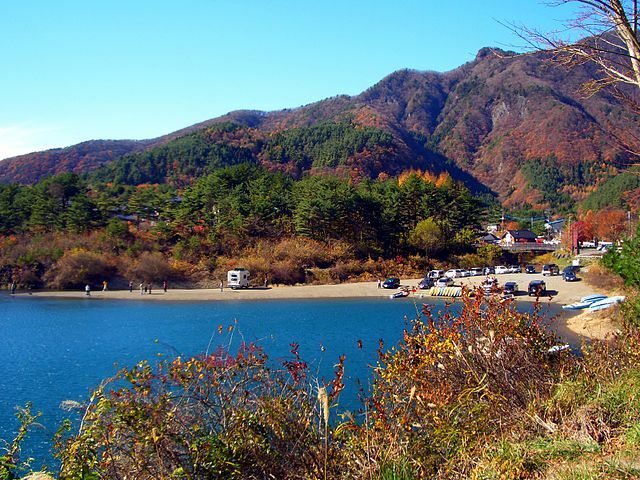 To get to the northeast shores of the Lake where the image is taken, you can take the Omni Bus Blue Line which connects Kawaguchiko Station, Lake Shoji and Lake Motosu. From Kawaguchiko Station to Lake Motosu takes around 50 minutes. Lake Shoji is the smallest of the Fuji Five Lakes. Outdoor activities such as hiking, camping, fishing and jet skiing are popular around the lake. Lake Shoji borders the Aokigahara forest known as Jukai "Sea of Trees". ​The western edge of Aokigahara, where there are several caves that fill with ice in winter, is a popular destination for those interested in camping, hiking, boating, fishing and other outdoor activities. 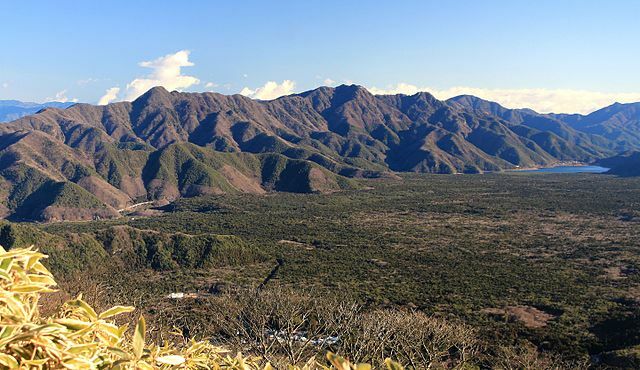 Aokigahara forest is also famous for its volcanic caverns and infamous as a suicide spot and for people getting lost. Aokigahara is a very dense forest and you can get lost very easily. Do not wander off the trail or into closed off areas. As long as you follow proper precautions, you'll be fine. ​Aokigahara is along Highway 139 on the Western shore of Lake Sai. 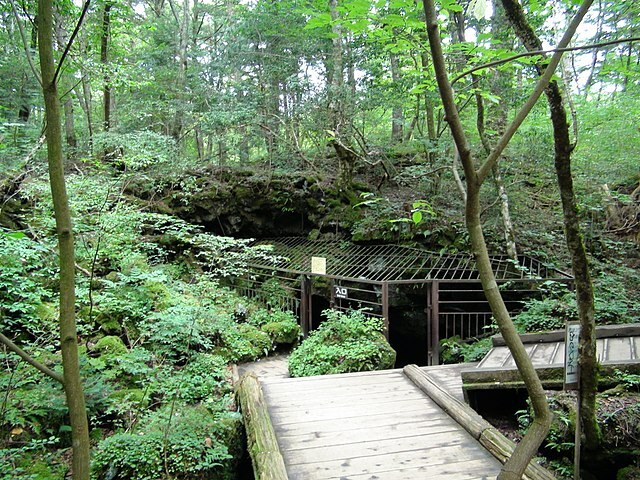 Several caves, formed during past eruptions of Mount Fuji, can be found around Aokigahara in the vicinity of Lake Sai. Three of them, the Ice Cave, Wind Cave and Bat Cave, have been developed to be easily accessible to tourists. All three were designated as Natural Monuments of Japan in 1929. The Bat Cave, named after its former winter inhabitants, is the most extensive of the three caves. The average temperature inside the Ice Cave is about 3°C. Consequently the cave has been used since the early 1900s to store ice for use around the year. The Wind Cave is the most easily walk-able and least exciting of the three caves. In the past, this cave was used as a natural storehouse and refrigerator. Inside the cave, there are icicles even in summer. From the Edo period to the Meiji period this cave was used to keep the eggs of silk worms. The cave has also been designated as a Japanese natural monument. 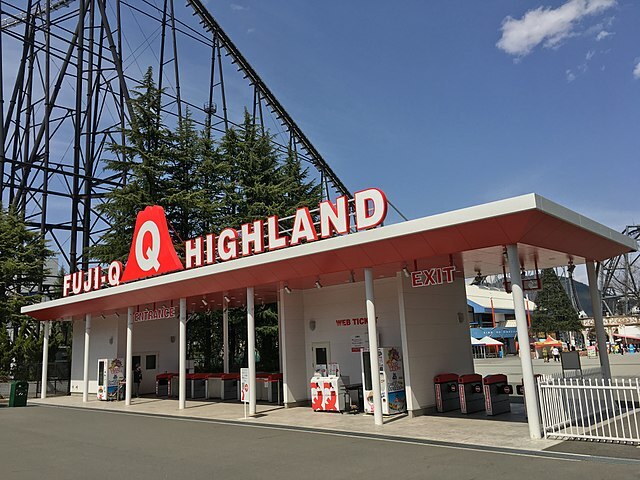 ​Fuji-Q Highland is one of Japan's most popular amusement parks and home to Fujiyama, briefly the world's tallest rollercoaster. It continues to rank among the best coasters in the world. The park has four major rollercoasters. The other three are; Dodonpa, 52 meters tall, opened in 2001 and was once the world's fastest rollercoaster. It is currently the parks speediest coaster. Eejanaika, 76 meters tall, opened in 2006 and is only the second "4th Dimension" rollercoaster ever built. "4th dimension" rollercoasters’ seats can rotate 360 degrees forward or backward in a controlled spin. And Takabisha, opened in 2011 and holds the world record for the steepest rollercoaster dropping at an angle of 121 degrees. 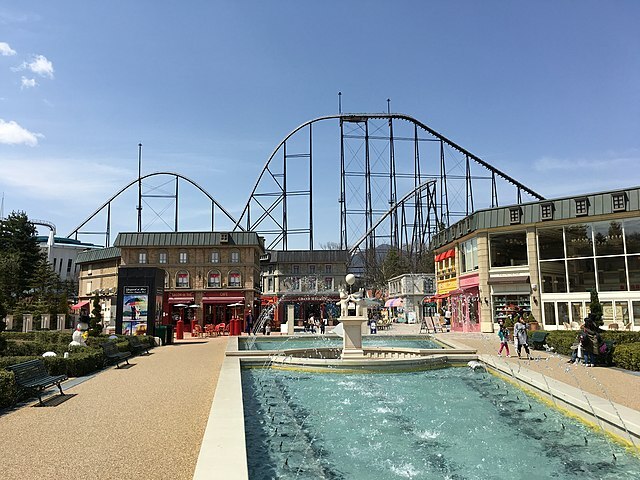 And for kids or those who just want something very light and fun; Fuji-Q has Thomas Land, which has Thomas the Tank Engine and friends as its theme; a merry-go-round, spinning teacups, and a Ferris wheel, among others. 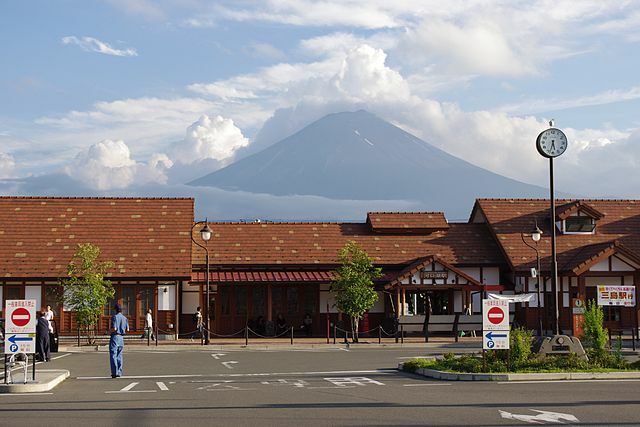 Also nearby just outside the park is the Fujiyama Onsen, a modern hot spring facility next to the Fuji-Q Highland Resort. The bath house offers both indoor and outdoor baths segregated by gender. It does not have views of Mount Fuji from its baths, but the mountain can be seen from the relaxation area. Many local buses and occasional Omni Buses on the Kawaguchiko Line stop at Fuji-Q Highland and Fujiyama Onsen. ​From Kawaguchiko Stations you can also take train on Fujikyu Railway Line to Fujikyu Highland Station which takes about two minutes. The Fujikyu Railway Line is not covered by the Japan Rail Pass, but it is covered by the JR Tokyo Wide Pass. Fujikyu and Keio Dentetsu Bus operate direct buses between the Shinjuku Bus Terminal in Tokyo and Kawaguchiko Station "takes about 120 minutes". Fujikyu and JR Kanto Bus operate direct buses between Tokyo Station "Yaesu South Exit" and Kawaguchiko Station “takes about 120 minutes”. 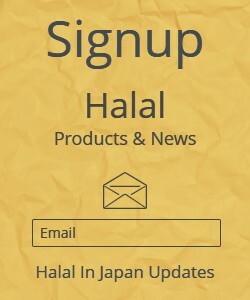 Online reservations can be made through Willer and Japan Bus Online. ​Fujikyu operate buses between Shibuya "Mark City", and Kawaguchiko Station "takes about 150 minutes". Sotetsu Expressway Buses connect Yokohama Station and Fujikyu Highland and Kawaguchiko Stations "takes about 90 minutes". If you have visited Maglev Exhibition Center and are headed to Fuji Five Lakes region for sightseeing, from Otsuki Station, take the train for Kawaguchiko Station on Fujikyu Railway "takes about 55 minutes". For regional maps and guidebooks visit Tourist Information desks.